Suzanne Woods Fisher has done it yet again! 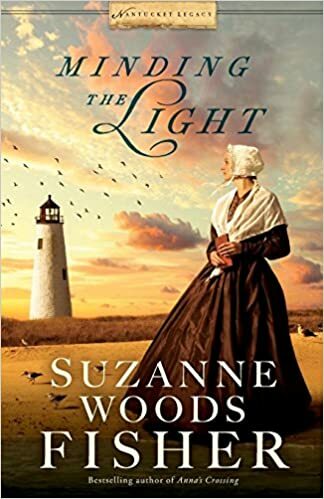 With her latest book in the Nantucket Legacy Series she started, Minding the Light hits all the right notes just as Phoebe's Light did. I have to say that as little as I know about Quakers and the history of the whaling industry of that time. Also, I found out while reading through parts of the book that Benjamin Franklin descends from a couple who were Quakers who came from the Nantucket area. I suggest picking up this book to find out more. That said, I can honestly say I loved reading this book. And while I sometimes tell you what the book is about, for the first time ever I won't do that. Rather, I want the focus to be on Suzanne Woods Fisher and her ability to writing a strong and compelling story through the characters she has created. Some of them mentioned are actual people from history, while others are characters of fiction. But again, I believe Suzanne has a definite style for not just writing a wonderful story, but giving us one that delivers. For me, I took my time in reading this, which is why I'm finally getting around to posting the review on this book. And I do so as it was a complimentary book given by Revell for an exchange of an honest and fair review of Minding the Light.